From 5-14 October, the European Foundation for Support of Culture together with the Kazakh National University of Arts – Kaznua are holding the Eurasian Stars Festival in Astana – the capital of Kazakhstan, with a reputation that has transcended national borders and made it a deserving participant of the Capitals’ Club of the modern world. 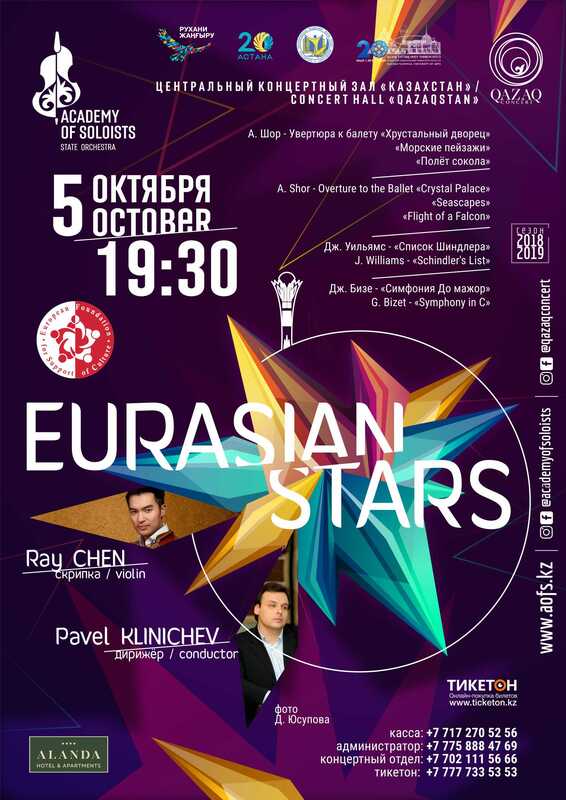 The Eurasian Stars program includes concerts by world renowned celebrities of classical music such as Misha Katz, Pavel Klinichev, Kristjan Järvi, Борис Андрианов (Boris Andrianov), Nareh Arghamanyan, Ray Chen, Askar Duisenbaev, Meruert Karmenova, Nicola Peretto, Vasily Stepanov, Anna Ulaieva and others. Concerts of the Eurasian Stars Festival are taking place at the most famous concert halls of Astana such as the Organ Hall KazNUA, Central Concert Hall “Kazakhstan” and Concert Hall KazNUA named after Zhabaev with participation of such famous orchestras as the Eurasian Symphony Orchestra and State Orchestra “Academy of Soloists”.